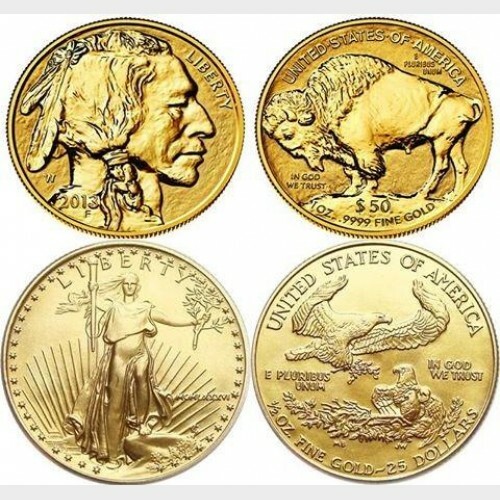 There are two: the American Gold Eagle and the American Gold Buffalo. The American Gold Eagle, or Gold Eagle if you will, is the US gold bullion coin in widest distribution. By all accounts it has done well against the competitive offerings of other countries. Notably, at London Coin Galleries Mission Viejo, it is the one gold coin that, due to local demand, we buy and sell above the gold spot price. So… is the Gold Eagle a solid gold coin? Absolutely. If you were to cut one in half and look at the edge of the cut you would see gold through and through. Is the Eagle a pure gold coin? No. Although the coin contains one troy ounce of pure gold it actually weighs more than one ounce. The amount above one ounce is an alloy of several other metals intended to make the coin more resistant to scratching. The Gold Eagle debuted in 1986 and has been made every year since. Fractions include coins of one half, one quarter and one tenth troy ounce. Each is alloyed in the same manner as the once ounce coin with a proportional overage of alloy. Face value of the one ounce coin is $50, and $25, $10, and $5 for the fractions, respectively. The obverse design reprises the torch bearing figure of Liberty designed in 1907 by Augustus St Gaudens. The reverse is a modern offering known as “The Family of Eagles” by Miley Busick. 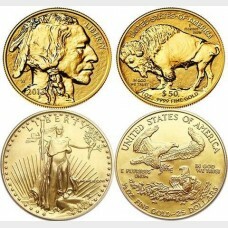 The American Gold Buffalo, introduced in 2006, is less well known than the Eagle. The coin is produced in unalloyed pure gold, refined to the .9999 standard. A truly stunning coin to look at, it replicates the design of the 1913 Buffalo Nickel of James Fraser. Mintages are considerably smaller than for the Eagle. In 2008 a four coin set was produced that included one half, one quarter, and one tenth ounce coins along with the one ounce coin. Gold Buffalo coins are produced only at the West Point Mint. Proof coins are available in both the Eagle and Buffalo series, at a premium. When visiting our store ask to see examples of each of the American Gold Bullion coin series. The next post will spotlight the Gold Maple Leaf of Canada.